Josh Mandel represents the 17th House District serving the greater Cleveland area. 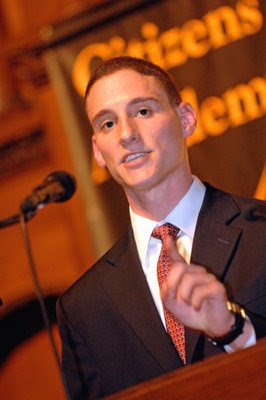 Josh Mandel will be the featured speaker for COAST’s April General Membership Meeting on Wednesday, April 1, 2009 at 7 PM at Molly Malone’s in Pleasant Ridge. This event follows up on the enormously successful COAST fundraiser in February featuring former Congressman John Kasich and State Auditor Mary Taylor. Mandel is starting his second term in the Ohio legislature, where he was one of nine conservatives who opposed Speaker Husted on a pork barrel-laden spending program, and the implementation of new hotel-and lodging tax increases for Montgomery County. He supports both the Kasich plan and the John Adams/Buckeye Institute Plan to phase out the Ohio income tax. Before coming to Columbus, Mandel fought for and implemented the first-ever property tax rollback in the history of Cuyahoga County. Molly Malone’s is located near the intersection of Ridge and Montgomery Roads at 6111 Montgomery Road. For more information on the event, contact Jason Gloyd here or via telephone at 513-240-4996. Molly Malone’s number is 513-531-0700.